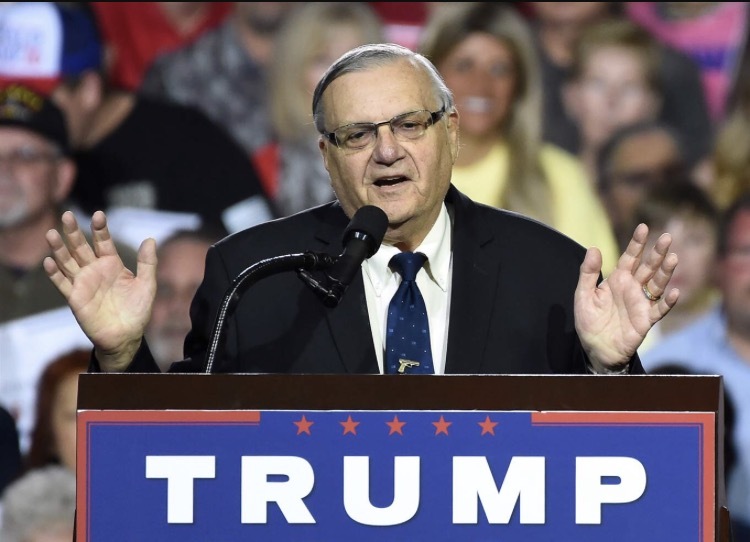 On Monday, a mere hour and a half after Trump finally condemned white supremacists who marched through Charlottesville, the Washington Post broke a story saying Trump had told Fox news he was considering pardoning former Arizona Sheriff Joe Arpaio. Arpaio was convicted of criminal contempt last month when he refused to comply with a judge’s order to stop detaining people because he suspects they are illegal immigrants. Of Arpaio, Trump said, “Is there anyone in local law enforcement who has done more to crack down on illegal immigration than Sheriff Joe? He has protected people from crimes and saved lives. He doesn’t deserve to be treated this way.” Trump’s comments show just how hollow his recent statement on Charlottesville was, because Joe Arpaio is a racial profiler and a horrendous man. In large part because of Joe Arpaio, Arizona has for years been known as a state with some of the worst immigration policies. Arizona’s SB1070 anti-illegal immigrant law was ultimately struck down by the Supreme Court because it encouraged racial profiling. The law, fully titled the “Support our Law Enforcement and Safe Neighborhoods Act,” was enacted in 2010. The act made it a misdemeanor crime for an illegal alien to be in Arizona without carrying registration documents. This meant that state law enforcement could lawfully stop, detain, and even arrest someone on the suspicion that the individual was an illegal alien. Of course, this lead to thousands of arrests based off of nothing more than racial profiling. Let it also be noted that the Nazi secret police, the Gestapo, had the same authority to stop people and demand to see their papers. Not the kind of comparison American government officials should strive for. In 2011, a federal district judge in Arizona ordered that Sheriff Arpaio halt detention “based solely on suspicion of a person’s immigration status when there was no evidence that a state law had been broken.” Arpaio appealed this order but the ruling was upheld. Despite this, Mr. Arpaio continued to publicly claim that his practices were legal and to advocate for detentions based on suspicion. It was ruled several weeks ago that Arpaio had willfully violated the 2011 court order and Mr. Arpaio is potentially facing several months in prison. Speaking of prisons, one cannot discuss Arpaio without mentioning his Tent City Jail. Opened in the 1990s, Arpaio created a prison that was the physical representation of his “tough on crime” stance. Inmates who were sent there lived in outdoor tents, even through the summer when Arizona temperatures can rise well above one hundred degrees. They were made to wear striped prison jumpsuits and pink underwear. Arpaio was known to take reporters on tours of the prison, bragging about his hardened stance on crime and using the inmates as a kind of physical presentation. Fortunately, it was announced in April that the prison would be shutting down. Arpaio commented that he wasn’t disappointed, that he did not create the prison “for the legacy,” though a legacy will be left behind nonetheless. That legacy will not be the one of the tough sheriff, but of a racist, power-hungry, and cruel man who took advantage of people coming to this country seeking a better life. It’s important, not just to discuss who Arpaio is, but the fact that this is the person Trump is going to bat for. It’s not Heather Heyer, who was killed protesting the hatred in Charlottesville. It's not Jews who were threatened by the "unite the right" movement. It's not black people who were assaulted in the streets. It’s not immigrant families or children of immigrants. The saying goes, “You can lead a horse to water, but you cannot make him drink.” Trump may have been lead to the podium to denounce the events in Charlottesville, but today he reminded us what his true beliefs are and where his allegiances lie. It’s our job to hold him accountable for those beliefs and to show him that our allegiance lies with real American heroes, like Heather, who stand up for what justice really is.